I've made my fair share of salsas, but the idea of a cookbook with nothing but salsas and moles sounded interesting. My typical salsas are .... well ... typical. Tomato, onion, peppers, cilantro. Maybe some lime. Sometimes I'll add another ingredient, but when I stray from my basic recipe, I usually wander right back to the original the next time I make a salsa. Yes, I'm a creature of habit. 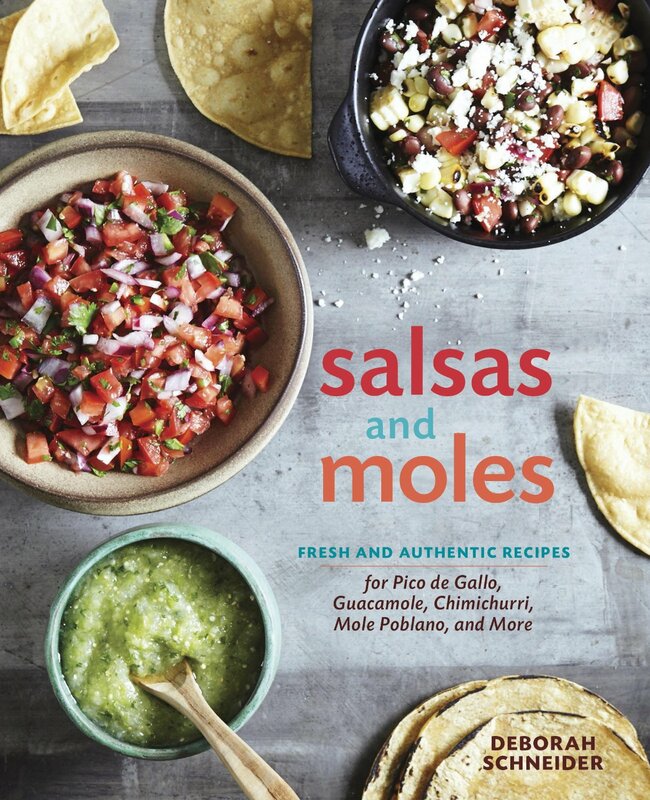 I figured that the book Salsas and Moles by Deborah Schneider would give me some new and different salsas to try, and perhaps refine my basic salsa. This is a small book, size-wise, but it's packed with quite a bit of information, starting with information about peppers and other ingredients. Recipes include salsas, hot sauces, moles, and a few other related items like cabbage slaw and pickled peppers. One great thing is that for the most part, ingredients shouldn't be too hard to find for many of the recipes. Dried peppers can be purchased online, if you can't find them locally. Fresh peppers might be a little trickier, but you can certainly substitute a similar pepper. The book even suggests making substitutions if you want a hotter or milder sauce. There are a few items that might be trickier to find, but that's true with many books. We don't all have access the same ingredients. While my first thoughts were about making salsas, I was really happy to see several recipes for different types of moles. The first time I tastes mole, I wanted to know how it was made, but pretty much everyone I asked told me to start with a jarred mole paste. Some of them are decent, but I like to make things from scratch at least once. I'll have to wait for some fresh ingredients to show up at the market, but it shouldn't be too long.